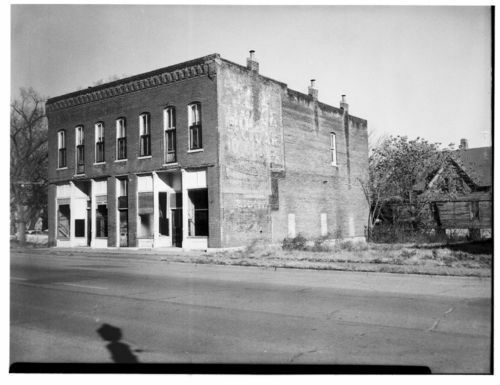 These photographs show exterior views of the front and back of Payne's Drug Store, located on the northeast corner of 4th and Monroe. This was the area impacted by urban renewal in Topeka, Kansas. The first photograph shows the brick building next to an empty lot. There are no signs visible identifying the store. The second photograph shows the back of the building, with a smaller wooden structure attached to it.